I have a soft spot for lemon desserts. Lemon Bars. Lemon Cheesecake. Lemon Cake. Lemon Merinque Pie. Good grief I’m hungry now. To me one of the best ways to let spring know you are welcoming it with open arms is by making, buying and eating as many lemon desserts as humanly possible. Okay, maybe that’s not the best idea since, you know, swimsuit season follows shortly after. But anyway, there are two desserts my family asks for quite often: lemon bars and anything with lemon curd. I’ll share my personal lemon curd recipe with you soon, but until then….enjoy these 50 Delectable Lemon Desserts. There you have it! 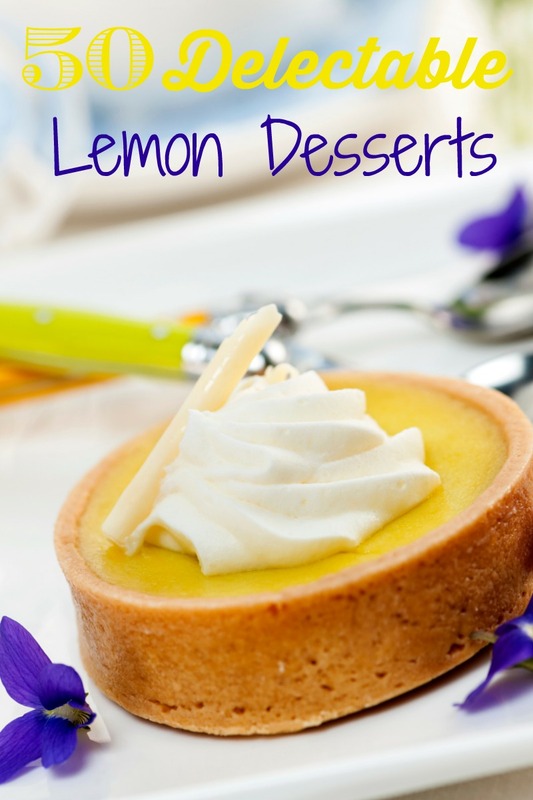 Fifty Delectable Lemon Desserts just waiting for you to roll up your sleeves and make. Or ask someone to make it for you. Either way. Which one are you going to try first? I’m thinking some Lemon Mousse is going to be happening around here very, very soon. Mmmm, love all of these lemon recipes! Thanks for featuring my Super Lemon Bundt Cake! You’re welcome Jessica! I can’t wait to try it!